The CM-700d spectrophotometer is an easy-to-use, handheld color measuring instrument with changeable aperture setting (MAV: Φ8 mm/Φ11 mm SAV: Φ3 mm/Φ6 mm). 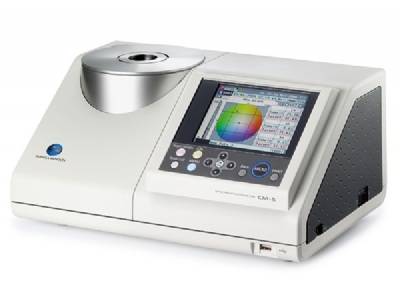 Using a range of user-friendly functions, the CM-700d Spectrophotometer effectively measures the color of an object. Ergonomically designed to fit your hand comfortably, this handheld instrument features a color LCD screen. Spectral graphs, pseudocolor, and color difference graphs are part of the plethora of information displayed on the screen. Measured colors can also be reproduced as color patches on the screen, useful in searching for colors or for checking the level of color difference. Dedicated buttons for frequently-used operations such as call up menus or target colors adds to the CM-700d Spectrophotometer’s ease of use. The menu-driven display makes operating the unit intuitive.